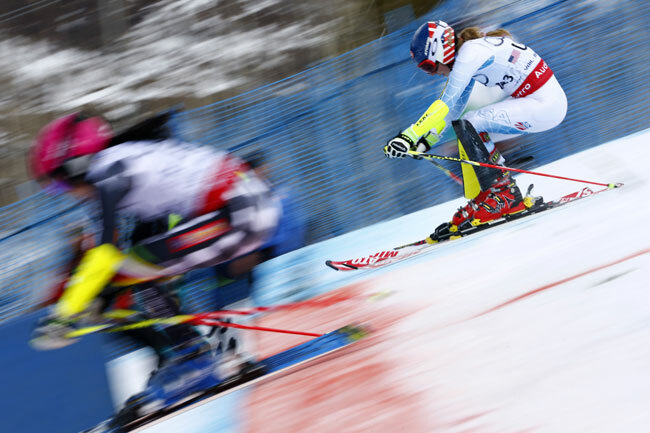 Mikaela Shiffrin races in the team event at World Championships in Vail last February. Some have suggested dual format racing as a possible way to generate more fan interest (Getty Images-Agence Zoom/Christophe Pallot). The 50th season of World Cup ski racing kicks off in Soelden, Austria, on Saturday, and a lot of the talk in the offseason – besides injuries and retirements – has centered on what’s wrong with the White Circus. The Vail Valley Foundation – coming off a highly successful hosting of the 2015 World Championships at Beaver Creek – announced it’s rebranding and hopefully reenergizing its annual Birds of Prey World Cup circuit stop, set this season for Dec. 1-6. But those seem like largely cosmetic fixes for what ails an aging race circuit in a demographically stagnant sport. Much bigger-picture change needs to occur in the International Ski Federation (FIS) offices in order to capture a larger North American and global market share, some experts contend. Outgoing Ski and Snowboard Club Vail Executive Director Aldo Radamus wrote an article in a recent issue of Ski Racing called The Top 10 Ways to Save the World Cup – suggesting everything from format changes to more and different venues spread around the globe and not concentrated in the Alps of central Europe. And no less of an expert than 20-year-old Olympic gold medalist Mikaela Shiffrin, the defending giant slalom champion in Soelden, told Real Vail last year that ski racing is a dying sport. She recognized the energy and vibrancy of new-school snow sports such as halfpipe and slopestyle skiing and snowboarding, while simultaneously lamenting their talent drain on alpine racing. Eagle-Vail’s Shiffrin on Saturday is going for only the second GS win of her already storied career, to go along with 14 World Cup slalom victories (not to mention an Olympic slalom gold and two World Championship slalom golds). But what she really wants is to begin to compete in speed events like super-G and combined in order to possibly capture an overall World Cup title. In 49 World Cup seasons so far, Americans have captured the top season-long honor 10 times. Vail’s Lindsey Vonn has done it an American record four times, followed by Phil Mahre (three), Bode Miller (two) and Tamara McKinney (once). This season’s path to the overall just got a little easier with the unfortunate training injury of two-time defending overall champ Anna Fenninger of Austria and the one-year hiatus of Slovenia’s Tina Maze, who won the overall the year before Fenninger started her run. After fracturing her ankle in training this summer, Vonn, who holds the women’s record with 67 career World Cup wins, got back on skis on Thursday, although she hasn’t committed to racing on Saturday and was not on the United States Ski and Snowboard Association’s start list. Neither was Miller (for Sunday’s GS). He tore a hamstring crashing in the super-G at Worlds in Beaver Creek last February, and has talked about calling it career. Vonn turned 31 last week, and has talked about continuing to race through the 2018 Winter Olympics in South Korea and adding to her remarkable tally of 67 wins. Shiffrin, who turned 20 in March, has 15 World Cup wins, which is already tied for 25th on the all-time list and just three shy of matching McKinney’s 18 wins and jumping into second among American women. “The stats, they’re definitely in my mind. It’s something that’s just tangible and that’s kind of what makes this sport a sport. It makes it worth watching, to be able to have some kind of a record to break. Somebody sets a record and somebody else breaks it and then somebody else breaks that one, and that’s where the excitement comes from. It’s definitely in my mind, but I’m not out here just to beat whatever record Lindsey set. “I think it’s cool [new-school pipe and park sports]. Of course the more sports there are in skiing, kind of alpine-related skiing, or just in skiing — freestyle, the X Games, snowboarding, the more sports there are to do on snow — people are going to spread themselves more thin, and alpine ski racing won’t have as many people. But I think it’s really cool to see all the different personalities, and I really think it’s great that there are events to match personalities. One of those personalities is Telluride’s Gus Kenworthy, a slopestyle skiing silver medalist at Sochi, who revealed he’s gay in ESPN The Magazine. SOELDEN, Austria – On Saturday, all eyes will turn to the majestic Rettenbach Glacier in Soelden for the 2015-16 Audi FIS Ski World Cup opener. In the ski racing community, this could very well be considered Mecca. The excitement and speculation around the season opener is swirling and surging around the glacier. Who will come out on top? Will Mikaela Shiffrin (Vail, CO) prevail, winning her second straight Soelden season opening giant slalom? Will Ted Ligety (Park City, UT) regain his Soelden dominance? Will Lindsey Vonn (Vail, CO)—the winningest female in World Cup history—be back in the start hut? Though Ligety says that it’s possible that fans will enjoy a duel between he and Austrian powerhouse Marcel Hirscher, he is quick to note others who are likely threats, like the Attacking Viking duo composed of Norwegians Aksel Lund-Svindal and Kjetil Jansrud, Frenchman Alexis Pinturault, and even the young Norwegian Henrik Kristoffersen. Don’t be fooled, though. With an insatiable appetite for the win, Ligety is gunning for the overall GS title once again. He’s been skiing fast in training and he’s hungry. Shiffrin is coming into Soelden strong, but will be a target of the top women who saw her win her one and only giant slalom a year ago on the glacier. Shiffrin, who has been training on the Moelltaler Glacier in Austria, has won three straight Audi FIS Ski World Cup slalom titles, but wants to move into more GS and speed this season. Her opening day victory last year caught many by surprise. Veteran Julia Mancuso (Squaw Valley, CA) announced that she’s sitting out Soelden this year to continue resting a nagging hip injury. Vonn, who suffered an ankle fracture training on-snow this summer, is headed for Soelden but has not decided on whether she will start on Saturday. As of Tuesday, the U.S. Ski Team had confirmed two women for Saturday’s opening GS and six men for Sunday’s race, including two first-time World Cup starts for Nick Cohee (Gardnerville, NV) and Hig Roberts (Steamboat Springs, CO). Universal Sports Network will cover the action live with women’s giant slalom on Saturday and men’s giant slalom on Sunday.